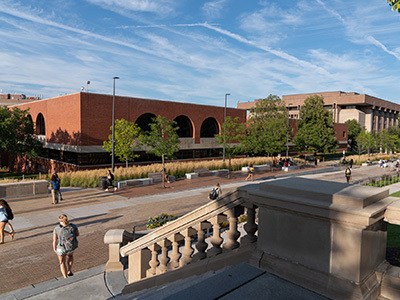 The campus community is invited to the renovation reveal and celebration of the Hildegarde and J. Myer Schine Student Center on Tuesday, April 9. The event also celebrates the legacy and philanthropy of Renée Schine Crown ’50, H’84 and Lester Crown. In the 1980s, Renée led the initiative to establish the student center and provided the primary gift, honoring her parents Hildegarde and J. Myer Schine for whom the building is named. The Crowns have been an active part of reimagining the Schine Student Center now to further enhance the student experience well into the future. As the hub of student life, the Schine Student Center will be transformed to fulfill its original mission as the “living room” of campus—a place for students to eat, gather, study and lounge. The renovation is scheduled to commence in May shortly following the conclusion of the spring semester. During the reveal, the Crowns will unveil the latest renderings for the planned renovation. The ceremony will include remarks from Chancellor Kent Syverud, Senior Vice President for Enrollment and the Student Experience Dolan Evanovich and Student Association President Ghufran Salih ’20. The ceremony is scheduled to begin at 2:30 p.m. in the atrium of Schine Student Center. Light refreshments will also be served. Communication Access Realtime Translation (CART) will be provided. For additional accommodation requests, please contact Candace Hayden at specialevents@syr.edu or by calling 315.443.0244. Opening and expanding the central atrium, creating a lounge on the main atrium floor and greater connectivity across the building’s floors. Versatile spaces and seating conducive to supporting student organization activities, studying, group meetings or lounging.